Thai Phase 1, Units 1-5 build on material taught in prior units. Each lesson provides 30 minutes of spoken language practice, with an introductory conversation, and new vocabulary and structures. Detailed instructions enable you to understand and participate in the conversation. 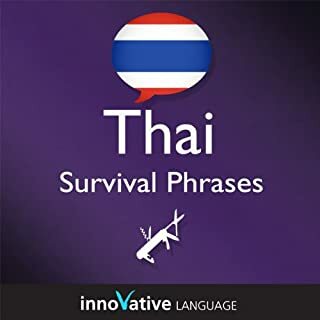 Start speaking Thai in minutes, and grasp the language, culture and customs in just minutes more with Survival Phrases - Thai, a completely new way to learn Basic Thai fast! Survival Phrases - Thai will have you speaking with proper pronunciation from the very first lesson and prepare you with cultural insight, travel tips and other information to utterly shock and amaze your friends and family, travel companions and people you meet along the way. Had some experience in Thai? Up the challenge with Beginner Thai. Master the basics of Thai conversation! 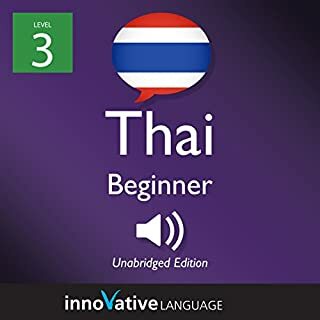 Start speaking Thai in minutes, and learn key vocabulary, phrases, and grammar in just minutes more with Beginner Thai. Our native Thai hosts break down all the sentences, grammar and more in a simple, easily understandable way! This isn't stale textbook material - it's fun, effective, and practical! 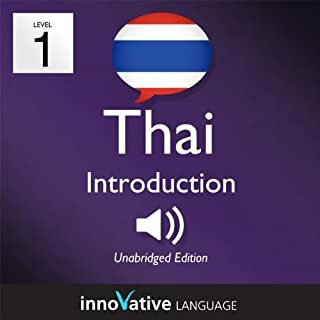 This audiobook will take you through the basics of Thai with Basic Bootcamp, All About, and Pronunciation lessons. The five Basic Bootcamp lessons each center on a practical, real-life conversation. You’ll go from basic concepts to advanced tips and will soon sound like you’ve been speaking Thai your entire life. Thai Phase 1, Lessons 1-30 includes 15 hours of spoken language practice and one hour of reading instruction in thirty, 30-minute lessons. In the first 10 lessons, you’ll cover the basics: saying hello, asking for or giving information, scheduling a meal or a meeting, asking for or giving basic directions, and much more. Start speaking Thai in minutes and grasp the language, culture, and customs in just minutes more with Absolute Beginner Thai, a completely new way to learn Thai with ease! Welcome to Everyday Thai for Beginners - 400 Actions & Activities by Innovative Language. This audiobook is a new way to learn and speak a language fast. Start speaking in minutes with powerful learning methods that you'll learn inside. Using this audiobook is simple. You'll learn practical phrases for over 400 daily activities through 10 easy chapters. The phrases were chosen by a panel of professional language teachers and are some of the most frequently used phrases in daily conversation. 1001 Easy to Learn Thai Words is the easy phrasebook you are looking for on your travels around Thailand. You will find all the words, sayings, and phrases you need, and more to help you get by in Thailand with confidence. Ready to speak and understand Thai at an Intermediate level? Close your eyes and picture yourself arriving at an airport, walking out and finding yourself on a busy street. Imagine hearing the native conversations all around you.This is the kind of Thai you learn here. Practical, everyday conversation. This audiobook is great for Intermediates ready to go past basic phrases like "How are you?" In fact, you start speaking in minutes. Thailand, Laos, and Burma have been known as the "Golden Triangle" because of their historically prominent role in the drug trade. For centuries, these countries have produced the opium that has attracted traders from Europe and elsewhere. Economics, religion, and politics combine to make this area not only important but also, to the western mind, exotic. Want to start speaking Thai minutes into your first lesson? With 3-Minute Thai - 25 Lesson Series Audiobook, you will easily learn the basics of Thai conversation with lessons made by real teachers. The best part? Each lesson is 3 minutes long. You also get the BONUS PDF version of the Audiobook to read along. Bangkok is one of the most exciting cities in the world. It has much to offer, from its delicious and plentiful food to its rich cultural history and bustling street life, and of course its abundance of beautiful women. In the past to find out how to get around Bangkok on a budget and enjoy its many salacious wonders you would need to buy your respectable guide that would tell you where to get the best Pad Thai and when all the temples opened and then consult unconvincing three year old online guides to meeting Thai girls. Want to immerse yourself in the Thai language and speak at a native level? Curious about Thailand and the culture? Then this audiobook is for you! With Advanced Thai, you get Thai-only lessons and learn the all about the country, culture, history, folklore, arts and popular destinations. Along the way, you'll pick up sophisticated expressions and advanced grammar. Do you want to learn Vietnamese the fast, fun, and easy way? And do you want to travel to Vietnam and get around like a pro? Then this is the audiobook for you. Learn Vietnamese: A Complete Phrase Compilation for Traveling to Vietnam is designed for absolute beginner learners and travelers. You learn the must-know travel phrases, survival phrases, vocab, and cultural insights to make your trip to Vietnam a breeze. All were hand-picked by our team of Vietnamese teachers and experts. Are you about to travel to Thailand? Do you need basic Thai and proper etiquette for business reasons? Do you have a Thai speaking partner, family, or friends? Are you a fan of Thai films, culture, or history, and want to start learning the Thai language? Whatever your reasons are, we've designed Survival Phrases - Thai with YOU in mind, so that you will get immensely satisfying results FAST! This is NOT a vocabulary builder with just words and their translations. Unlike other audiobooks, we actually TEACH Thai and Thai culture. Each lesson is TAUGHT by a professional, bi-lingual teacher! Listen to the preview now! Features: 30 audio lessons with key phrases, vocab, cultural insight, and practice - two+ hours! Downloadable lesson notes corresponding to each lesson - 50+ pages. A completely new way to learn Basic Thai fast! Survival Phrases - Thai will have you speaking with proper pronunciation from the very first lesson and prepare you with cultural insight, travel tips and other information to utterly shock and amaze your friends and family, travel companions, and people you meet along the way. This is an excellent basic Thai language book. It teaches very useful phrases for the traveler, which are presented clearly and distinctly. The “instructor” has a charming style; you can almost imagine being in a language classroom with her. What did you love best about Learn Thai - Survival Phrases Thai, Volume 1? I really liked this for what it is. 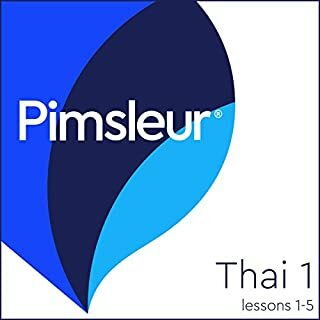 I've been learning Thai on my own and so far I found this series very useful. Great job. What about Savinee Asavanuchit’s performance did you like? Introduces Thai Culture as well as the language. I was searching for a translation book to use face with thai people. this book is more for lessons at home. 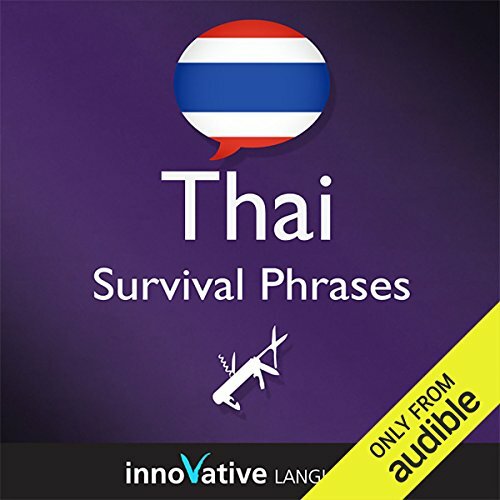 Did Learn Thai - Survival Phrases Thai, Volume 1 inspire you to do anything? Get another book to carry with me for translation.